Young African leaders at ASU reflect on Mandela 100 years after his birth. Twenty-five young African leaders visiting Arizona State University this summer are part of a generation that has grown up with the legacy of anti-apartheid revolutionary Nelson Mandela. Mandela, South Africa's first black head of state and the first elected in a fully representative democratic election, was born July 18, 1918. As president of South Africa from 1994 to 1999, he fought to dismantle apartheid and worked for racial reconciliation. The young people are at ASU as part of the Mandela Washington Fellowship for Young African Leaders, an intensive six-week program of academic work and community service. This is the fifth year of the program, begun in 2014 as the main part of the Young African Leaders Initiative in the U.S. Department of State. The 25 fellows at ASU are from 17 countries in Africa and are selected based on their accomplishments. Many own businesses, lead nonprofit organizations or teach. While here, each scholar develops a project that he or she can implement back in their communities. They also learn practical skills, such as marketing strategies and how to write a grant application. The fellows are between the ages of 25 and 35, so they were children during Mandela’s presidency and the major changes that swept South Africa. Jordan Griffiths, 28, is the policy adviser to the executive mayor of Pretoria, one of the three capitals of South Africa. “My journey is unique. I’m a young, white South African, so I am a minority,” he said. “I’m an English-speaking white South African, which also puts me in a smaller group as well. Griffiths said that Mandela’s legacy is in how he effected such dramatic change. “He spent well over a quarter of his life in prison, under apartheid, and he came out of prison and was able to negotiate a peaceful transition for South Africa from apartheid to a democratic society,” he said. Daniel Kanyambu Mbonzo of Kenya said that among Mandela’s lasting contributions to Africa is the leader’s public acknowledgment in 2005 that his son died of AIDS. “Back when his son died, HIV was not accepted in Africa. We still had stigma. People were thrown out of their communities because they were HIV-positive,” said Mbonzo, who is a nurse and runs a wellness organization. “I use that in my personal project,” said Leparteleg, who is from the Samburu community in Kenya. Known as the “Butterfly People,” they move around frequently in search of water and pasture for livestock, and most of the girls do not go to school. “I got a degree in business information technology, which was a first for my community. When I started a career in technology I decided to go back and empower the girls,” she said. Lelparteleg started an education organization, Butterfly Techies, to encourage girls to pursue education and careers in science or technology. “I’m having my first bunch of girls clearing high school and hopefully (will) have them get their bachelor's in STEM careers,” she said. Using segments of DNA, researchers at ASU have constructed a pair of tweezers, measuring 100,000 times tinier than the width of a human hair. A brief burst of ultraviolet light causes the jaws of the tweezers to switch from their closed to open position in seconds. The research, which appears in the journal Angewandte Chemie International Edition, was carried out by Nick Stephanopoulos and his colleagues at the Biodesign Center for Molecular Design and Biomimetics at Arizona State University. Stephanopoulos is a 2018 recipient of the National Science Foundation CAREER Award, the NSF’s most prestigious and competitive honor for early-career investigators. The laser-activated tweezers described in the new study are just one example of programmable nanostructures capable of interfacing with biological systems, including living cells. “Biological molecules such as DNA and proteins are the perfect building blocks for making nanoscale devices because they can spontaneously self-assemble into complex structures. Our job as nanotechnologists is to figure out the design rules and synthetic approaches, for making molecules that can form all sorts of interesting shapes and assemblies,” said Stephanopoulos, who is also an assistant professor in ASU's School of Molecular Scienes. Stephanopoulos works in the Biodesign Center for Molecular Design and Biomimetics directed by Hao Yan. To date, the center has successfully produced a dizzying array of two- and three-dimensional objects including sophisticated logic gates, nanorobots capable of dynamic activity and nanoarchitectures ranging from Mobius strips to silica-based structures resembling aquatic diatoms. The new NSF project led by Stephanopoulos has three primary goals: to develop nanofibers (similar to those in tissue) composed of DNA elements linked by proteins, to design and construct three-dimensional cages mimicking viruses from both protein building blocks and DNA scaffolds, and to engineer mechanical elements like hinges or boxes with latches that are activated by proteins. Augmenting DNA structures with protein components improves their stability and permits interactions with cells that could not be achieved with DNA alone. The proteins could also be used as actuation elements to switch the nanostructures using stimuli such as light. The resultant forms may find their way into gels to stimulate cellular repair, remotely triggered cages for releasing therapeutics to diseased cells and nanorobotic machines for a broad range of applications. Scientists would like to design smart, programmable structures capable of interacting with cells and tissues. Such advances will have broad applications in disease diagnostics and treatment, engineering of new tissues and the uncovering of underlying scientific mechanisms. Researchers coax segments of DNA to form elaborate structures at an incredibly minute scale. The technique, known as DNA origami, relies on the fact that DNA’s four nucleotides, labeled A, T, C and G, stick together in a predictable manner: A nucleotides always pair with T and C nucleotides always pair with G.
Nanoscale architects like Stephanopoulos would like to design DNA-based devices for a range of applications that can function in a stimulus-response manner. Such structures could be applied for studying receptor binding events, creating dynamic new materials such as artificial muscles or adapted as drug delivery devices. The new light-controlled tweezers, which are the first of their kind, have two key advantages. First, they open about 60 times faster than tweezers requiring an external trigger strand. Second, the new stand-alone structure could potentially be delivered into living cells and activated with light, dramatically expanding its potential applications. Dynamic DNA nanotechnology often makes use of toehold-mediated strand displacement reactions. In this example, the red strand binds to the single-stranded toehold region on the green strand (region 1), and then in a branch migration process across region 2, the blue strand is displaced and freed from the complex. Reactions like these are used to dynamically reconfigure or assemble nucleic acid nanostructures. The design of the new tweezers takes an innovative approach, incorporating the trigger mechanism into the nanostructure itself. In this case, the trigger strand is modified with a photocage — a chemical blocking group that prevents the trigger strand from binding with its complementary sequence. The tweezers are initially held shut by a single-stranded DNA segment. 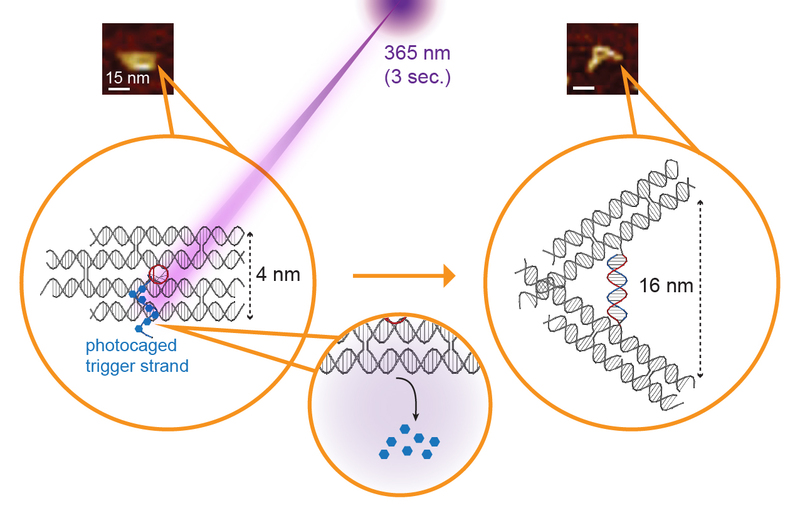 Shining ultraviolet light removes the photocage and allows the trigger strand to bind its complementary sequence, which springs open the tweezers.